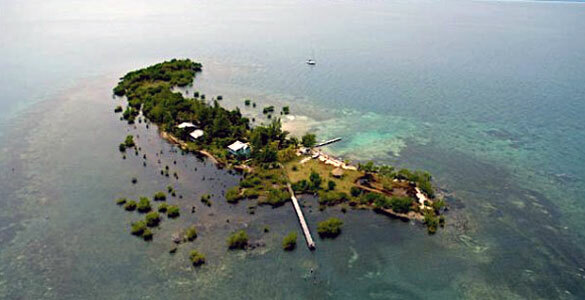 Whipray Caye is a very small private island located eight miles off the coast of Placencia, Belize, Central America. 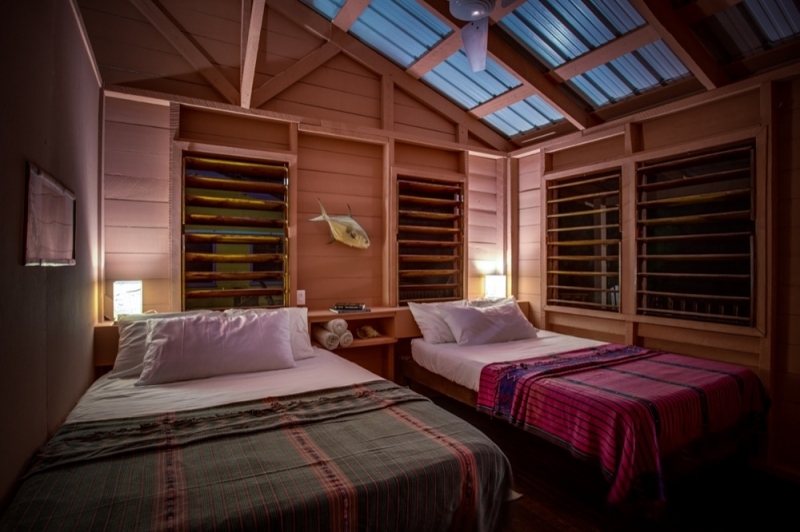 Whipray Caye Lodge is owned and operated by Julian Cabral and his American wife Beverly, Whipray Caye Lodge is custom made for serious salt-water fishermen and the independent traveler wanting to step away from everyday stress into a pure and natural world – where the fast pace comes to a splashing halt. 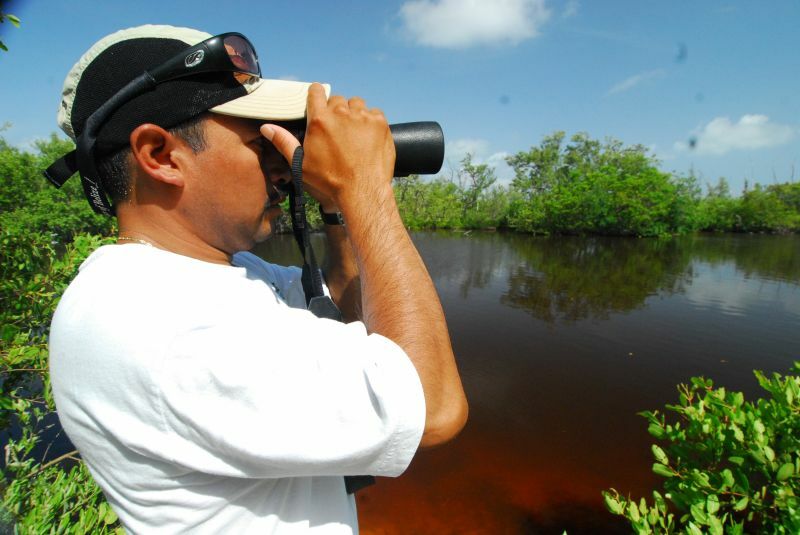 This is a very remote and unspoiled area – one of the few remaining in the Western Hemisphere. With warm smiles and ice cold Belikins at the ready, Julian and Bev make it very easy to unwind and adjust to the slow rhythms of island life. 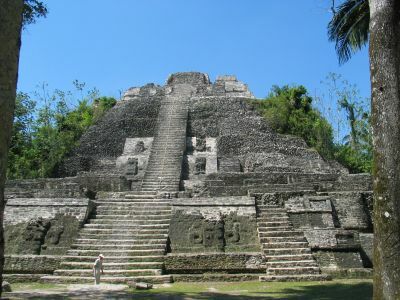 Your trip starts with your arrival at the International Airport in Belize City. We take over from there. You will board a commuter plane shortly after you clear customs and fly to Placencia about a 20 minute flight. 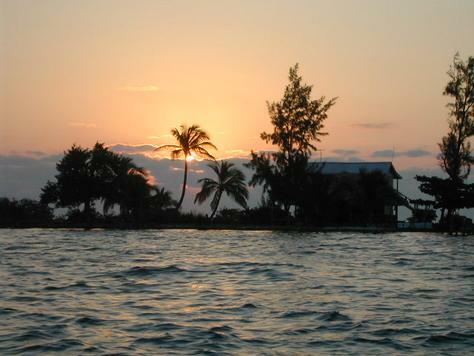 You will need to hire a taxi to the town boat dock for the 40 minute ride out to Paradise ( Whippari Caye). This is a serious fishing destination with few frills but lots of fishing time. 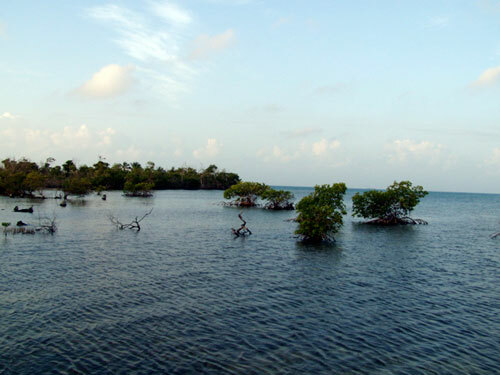 The Island is small with some native palms, mangroves and other vegetation. 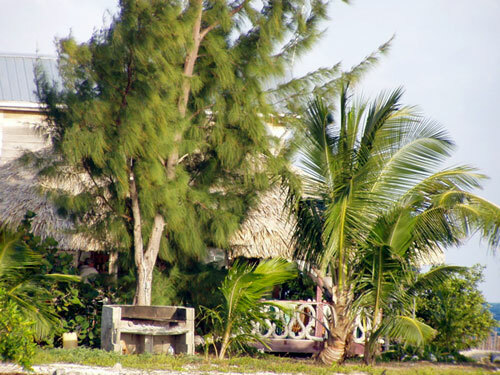 On the Island you have the Central restaurant and bar, the main house, a guide cabana and 4 guest cabanas. 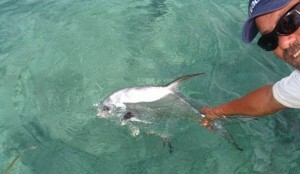 There are fish all around the island and this permit was taken right off the dock! Your day starts at the agreed time with you and your guide. It may be earlier than sunrise if the tides are such that this offers the best shot at the species you are seeking. 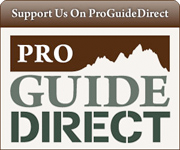 The guides have no problem getting up to hit the right conditions. Breakfast is served and lunches are loaded into the boats and off you go. As close as 5 minutes for some of the permit flats to as long as an hour for tarpon ( depending on the season) There are hundreds of islands and flats that dot this area between the barrier reef and the main land. You will rarely see another boat. 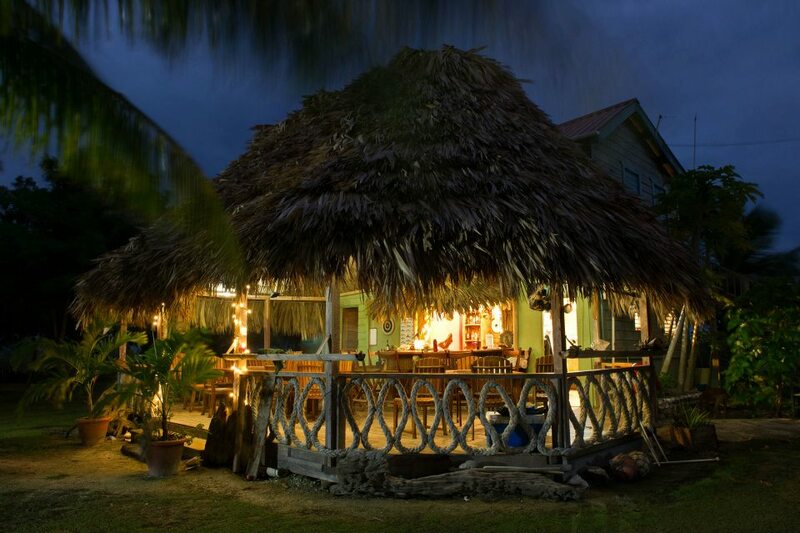 At the end of the day you will return to your private island for a few beers, maybe a margarita and a great dinner. There is no shortage of food. See if you can sit still while a bonefish tails in the setting sun while you have a beer in your hands. If you can you have finally relaxed and are a member of fly fishing heaven! Carrying on a family operation means walking in some pretty big shoes. 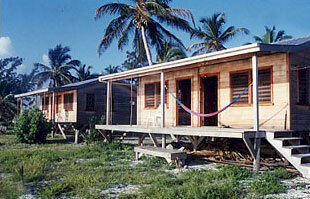 Whipray Caye had been a vacation home to the Cabral family for over 30 years, a fishing camp operated solo by Julian off and on for over 15 years, and finally, after Hurricane Iris leveled the caye in 2001 and destroyed much of the mangroves and vegetation and ALL of the buildings, Julian and his soon-to-be wife Beverly decided to take over the family lease and start over. What a way to start a marriage! They began rebuilding the first cabana after many months of clearing away the hurricane debris with helping hands from friends and family. 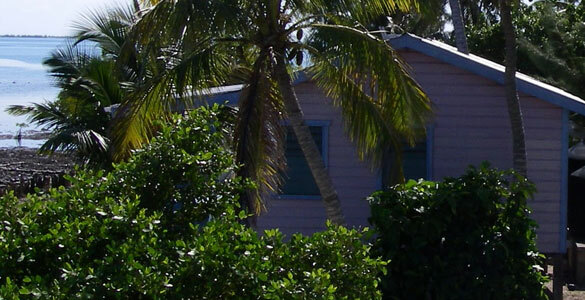 When the first cabana was livable, Julian and Beverly moved in and greeted their first fishing guests who also happened to be dear friends who have returned to Julian year after year for the last 15 years. They officially opened as a fully operational lodge in December 2002, and married in January 2003. Julian began his fishing career when he was a young man of 6 years old, traveling out in fishing dories with his dad George, and later with some of the ‘older heads’ in the fishing village, doing commercial fishing and learning the art of cooking for the crews while camping on various cayes, coming in to sell their catch and renew the ice supplies, and heading right back out again for more of the same. When fly-fishing was starting to catch on as a tourist attraction, Julian trained himself through experienced visitors from the fly-fishing areas of the states, fishing and camping with them for weeks or months at a time. The skills he picked up from them: casting and tying his own flies, led to a full-fledged career that he carries with him to this day. During this time he also supplemented his beer money by working for various resorts as a snorkeling and diving guide, a bartender, cook, house and boat builder and engine mechanic, electrician and general do-it-yourselfer. He also spent nearly 2 years working as chief engineer on a commercial fishing boat in Bermuda. 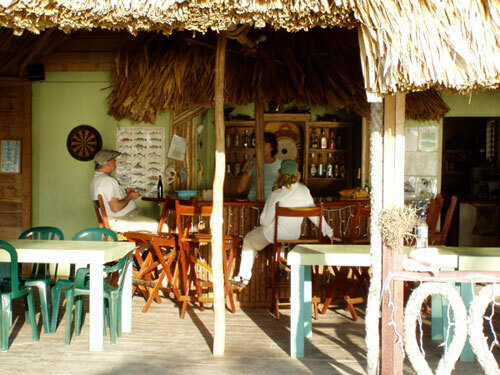 As a tour guide he met Beverly and her sons on one of their many trips to Placencia, and especially endeared himself to her when he treated her (successfully!) after she stepped on a Scorpion fish while snorkeling at the Silk Cayes. 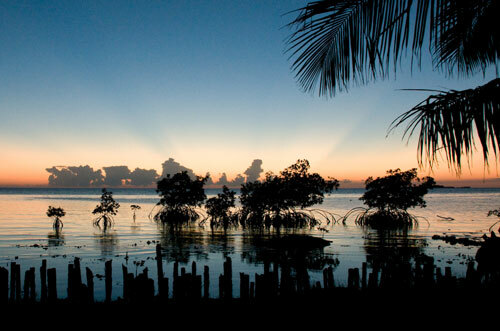 Finally, no one leaves Whipray without talking about the heart-stopping shots at the permit, tarpon and bonefish during a day out with Julian, and the incredible seafood dishes served family-style in the evening, sometimes cooked up by Julian, and all part of the Whipray Caye experience. 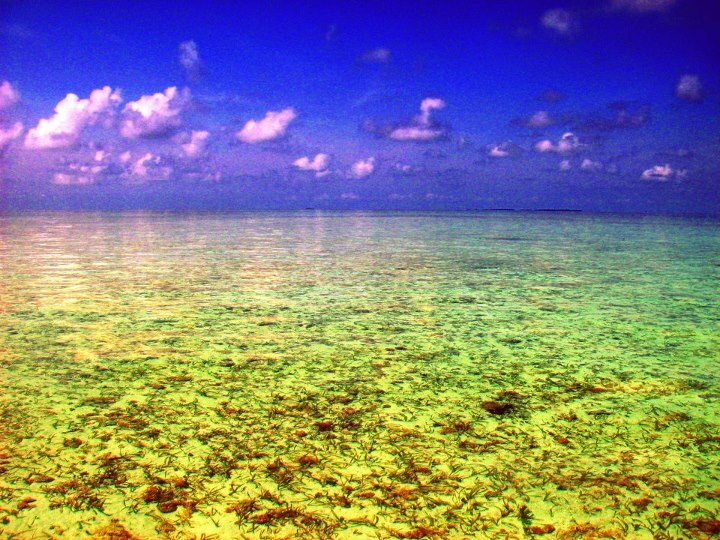 It is truly “Paradise Surrounded by Fish”! 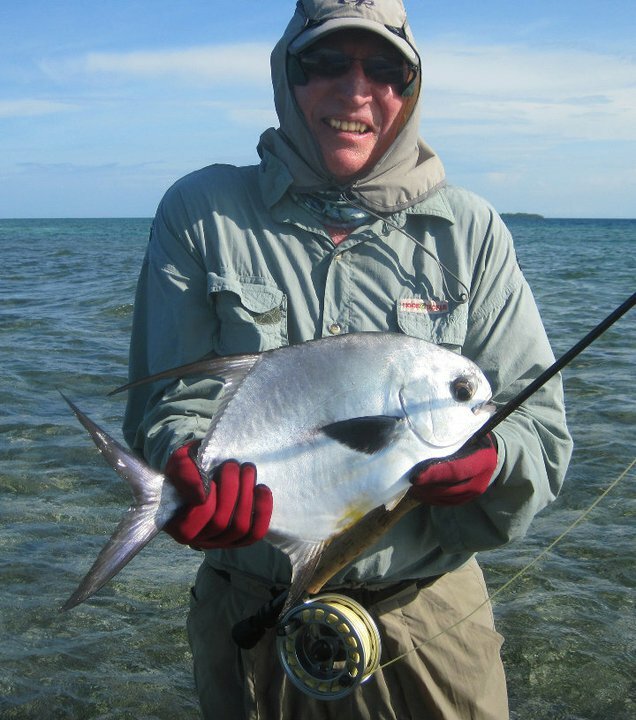 ” Over the past 13 years it has been my pleasure to fish with Julian. During this time he has shown great patience and skill in instructing two of my sons (me too!) in the art of fly-fishing. To complete the family cycle I have introduced my grandson and granddaughter to Belize, so I now have no shortage of fishing pals to share my annual 2 week visit. 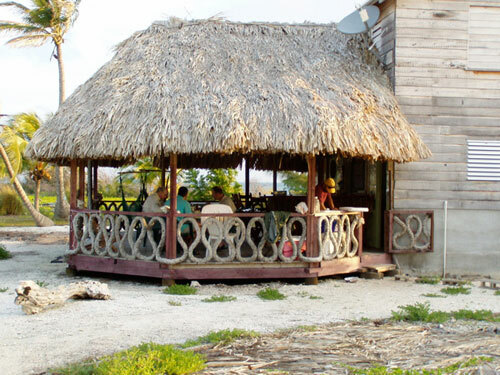 ” The infamous pirate Cabral that hid out in Placencia during the 1600s was probably responsible for the large clan of Cabrals who live in Placencia Village. At least 4 are fishing guides, and Julian is the mentor. 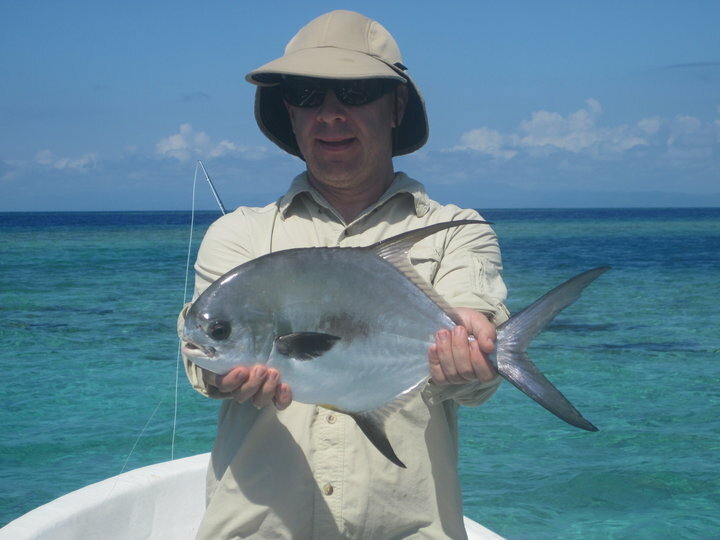 I have fished the Belizean waters once or twice a year every year since 1986. Thirteen times Julian has guided my wife and I. He is an excellent fly fisherman, boat handler and no one works harder. 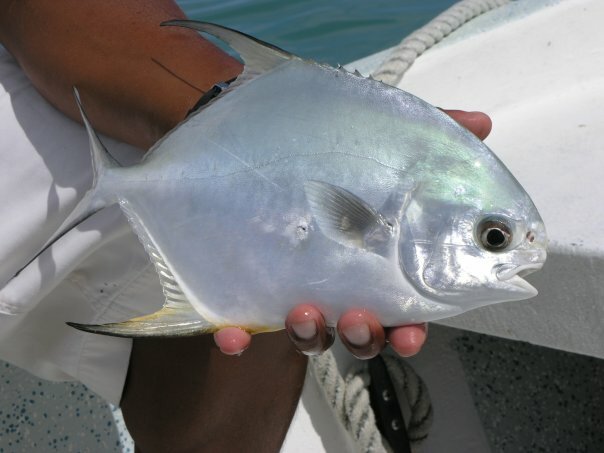 There are hundreds of flats and cayes but only so many are habitat for permit, bone fish and tarpon. 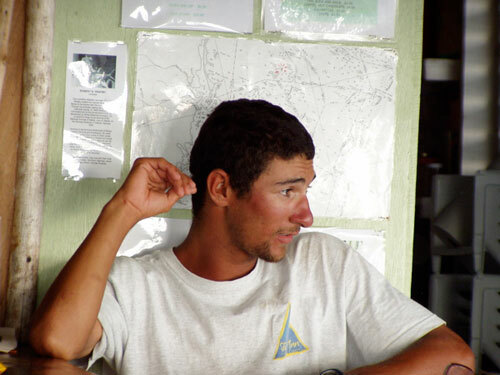 Julian knows them all and considering the tides, wind velocity and direction can locate the right area to fish. Skillfully poling the boat or wading the sand flats Julian is able 9 out of 10 times to spot the elusive fish before his client. My thrill is wading close to the fish, and without spooking it with the fly line, present a fly that the fish takes and powerfully runs with. 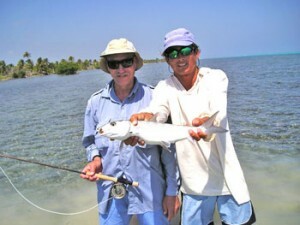 Fishing with Julian is enhanced by staying at his caye 8 miles off the coast of Placencia. 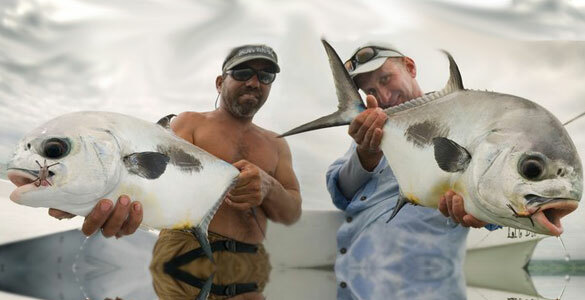 The location allows early dawn fishing and fishing local flats and cayes in weather that keeps other guides from leaving Placencia. 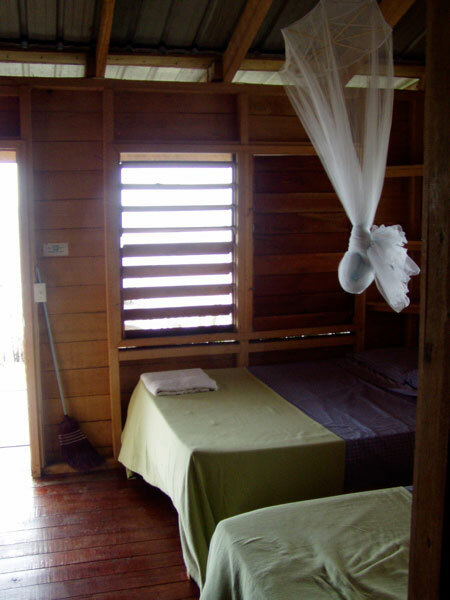 The lodge is owned and operated by Julian and Beverly Cabral. 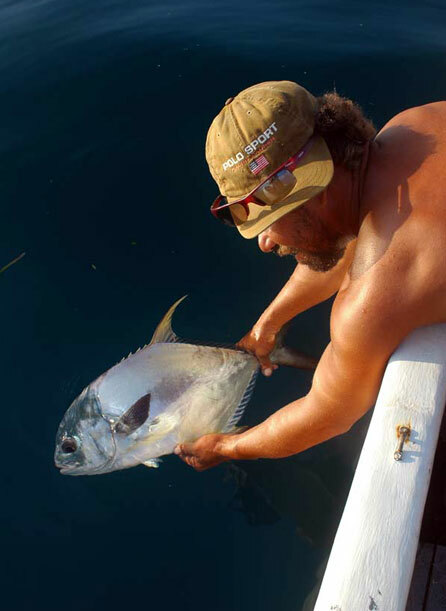 Julian has been a guide here since his teens and knows the water like no one else, His family has long been a factor in the sport fishing business in Placencia. 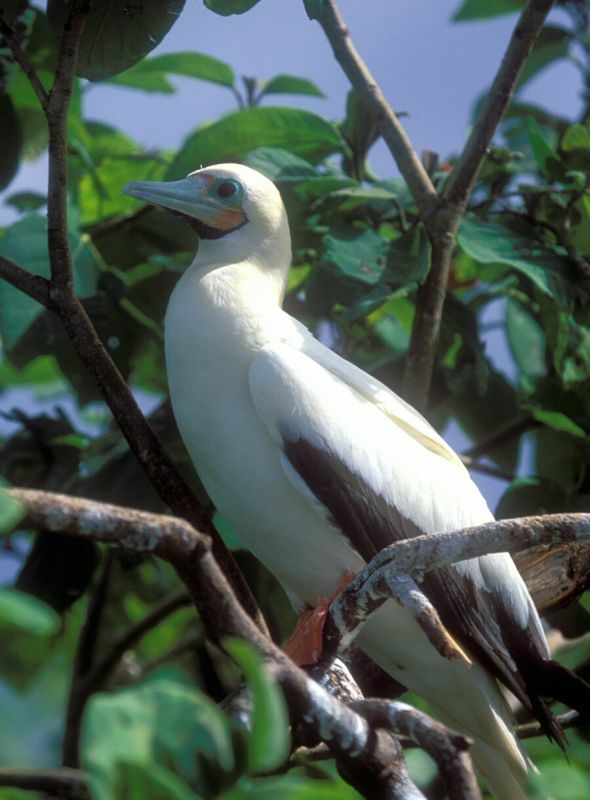 In fact he and his 13 brothers and sisters grew up on this island. To learn more about Julian and his approach to fishing jump to the fishing page. There are also some guest comments at the very bottom of this page. 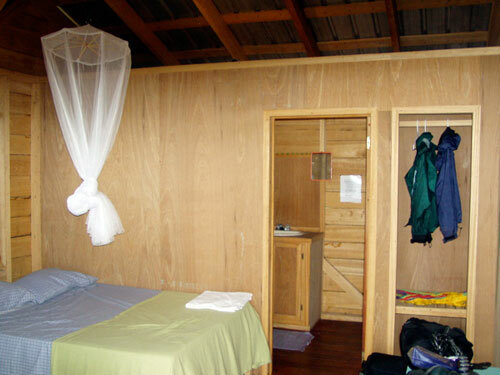 The 4 guest cabanas are in two separate buildings made from hardwoods from the mainland. Each has a private bath with hot water. Electricity is from a generator during certain hours and then by battery after hours. Rain water is collected and saved for drinking water and showers. 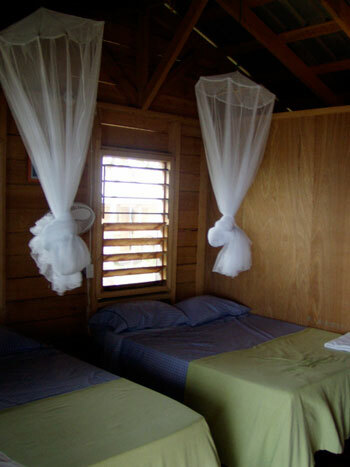 The cabanas are quite comfortable with two double beds in each cabana. Mosquito nets are provided for the little buggers that come out certain nights when the temperature is just right. During the day it is too warm for them. 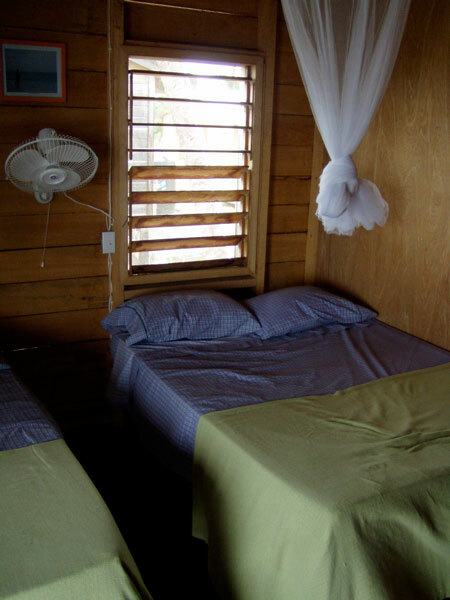 A trade wind coming off the ocean is usually enough to keep you comfortable at night. There is no a/c, phone television etc in the rooms. The lodge is rustic by many standards yet charming by others! 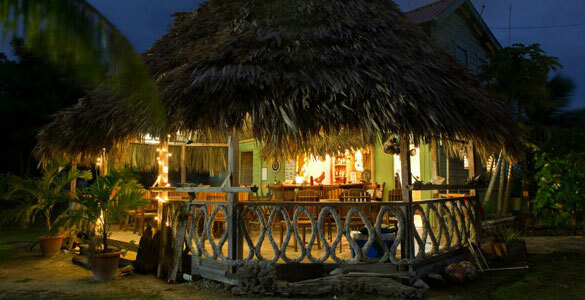 The main dining are is the Sea Urchin Restaurant and bar. 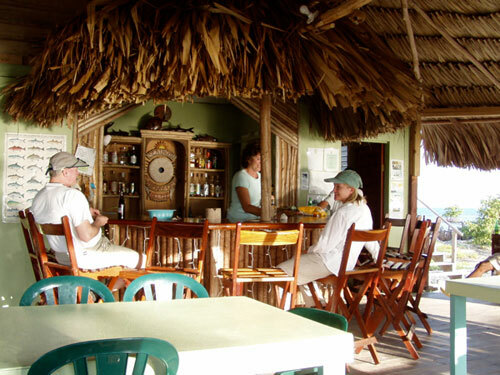 This is where your meals are served and a convenient place to trade stories of permit inspecting but not eating your fly, or that school of 100 bonefish, or the tarpon you jumped early in the morning. 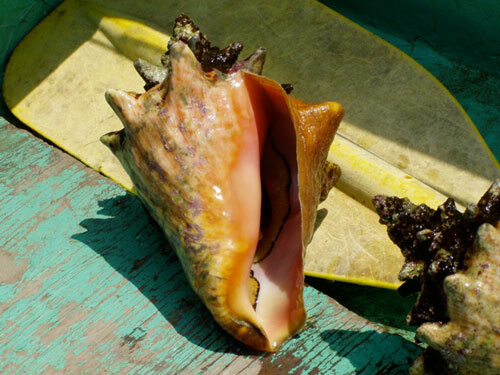 As you can imagine, lots of fresh seafood is served as well a a variety of other meals. This is not fish camp food it is Belizean cuisine grilled and cooked to perfection. 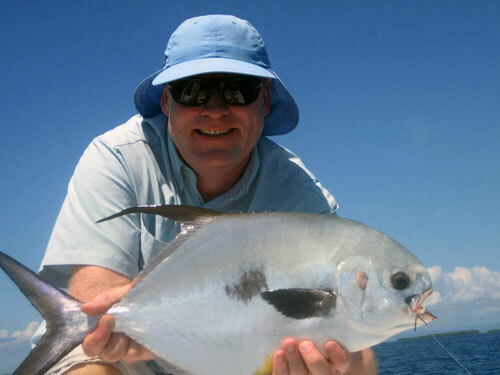 The fishing around Whippari Caye is extremely varied both as to the terrain you fish as well as the species available. I have to say it is perhaps the best permit destinations in the world. 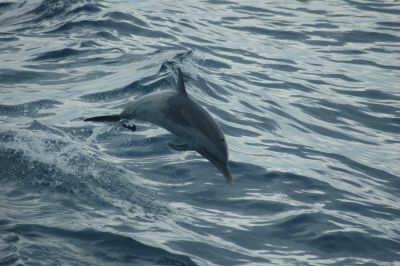 They alike to spot tailing fish, get out of the boat and pursue them on foot. 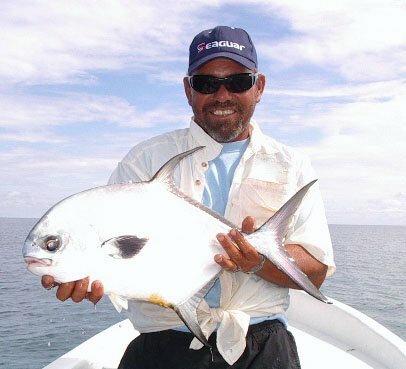 Even if you are looking for the big three, there are lots of Jacks, cudas and a myriad of other fish around. 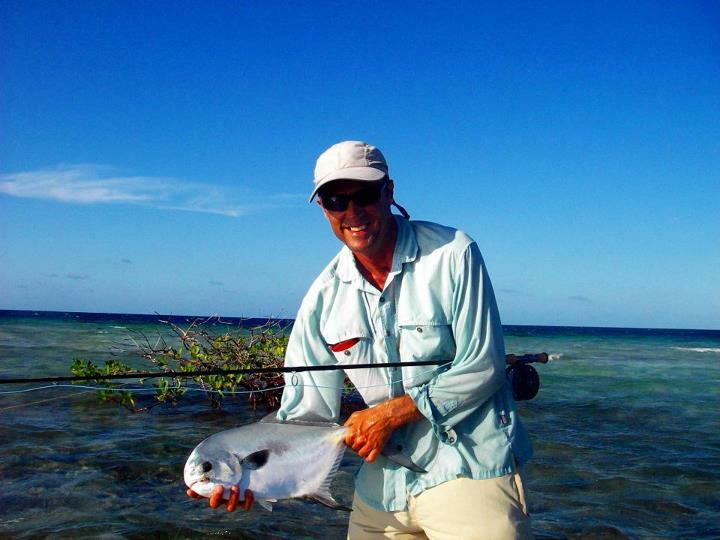 These trips concentrate on bonefish, Permit and Tarpon. 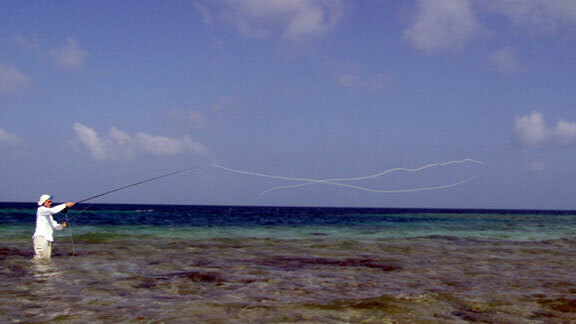 Bonefish are plentiful through out this area. 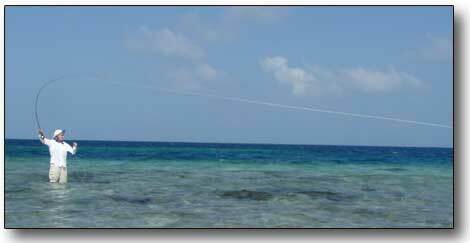 The fishing is usually around or between islands that have flats either surrounding them or at least on one side. Some flats are just in the middle of nowhere – another three feet and they would be islands. Maybe they where a few decades ago! 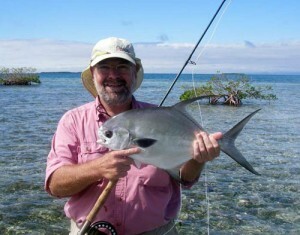 You will fish mangrove studded flats, clean white sand flats, and grass flats in pursuit of these fish. There are some larger fish in the area because there is quite a bit of habitat for them. Some fishing is from the boat and some is wading. Permit numbers go up significantly when you travel south from Turneffe or Ambergris and the protection of the reef offers the perfect home for permit: Deeper water with lots of structure and crab flats within an easy swim. 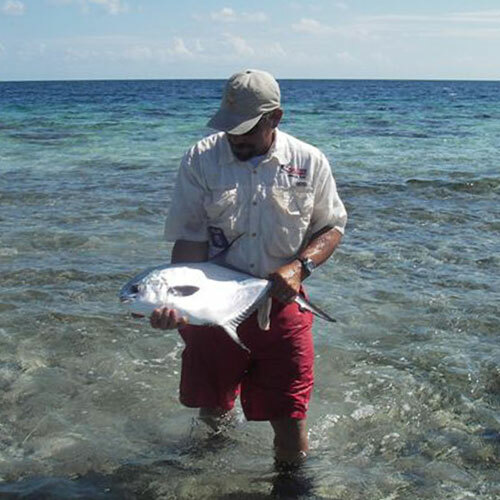 There are lots of permit flats that go from the island itself south to Honduras. This would be a good venue for the exclusive pursuit of permit. ( this doesn’t mean the others are not available in great numbers just that the permit are found in higher numbers than normal). Permit have a great sense of smell and great eyesight so getting them to eat a fly is something of an art – or at least persistence, well luck and persistence is more like it. 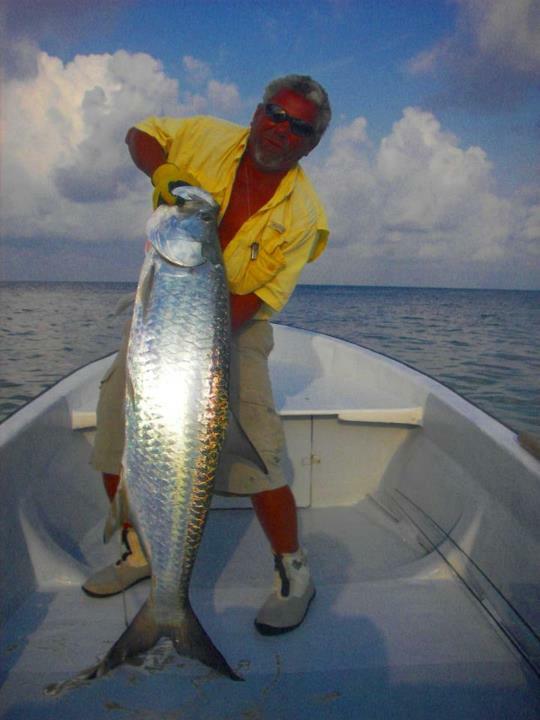 Tarpon can be found in deeper basins near mangrove islands, near the main land in rivers and creeks and in the late spring and summer they can be found on the flats. The resident fish range from 5-80 pounds with the migratory fish that weigh in over 100 pounds. Tarpon are the largest fish that can be stalked sighted and cast for. Billfish require a moving boat, with teasers so it is a little bit like trolling and then casting once a fish is teased in. (the boat is still moving when you cast!) There is nothing like casting to a huge roll near the mangroves, watching the tarpon track the fly, inhale it, turn and feel the hook. If you haven’t done it before, get ready to be cut down to size as the fight that follows is classic. From the time he was a young boy, Julian was wed to the sea. 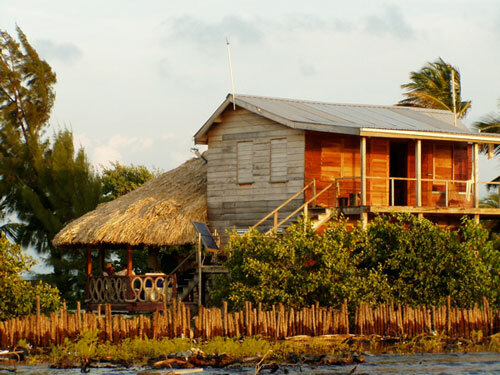 Using his family’s home on the cayes as the jumping off point, he spent many hours fishing with and learning from his dad, honing his instinct and skills. Today that passion for the sea has become his life. 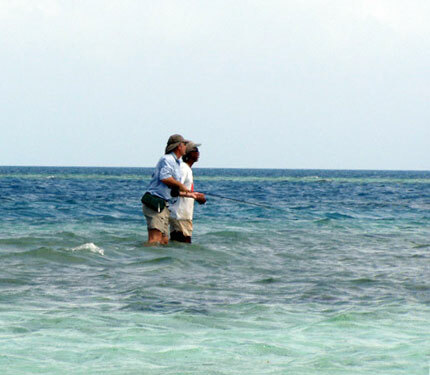 Using Whipray Caye (which he now owns and operates since his dad retired) as a fly fishing base and home, Julian is usually the first one on the nearby flats when he is guiding. Some of his customers are the same ones who knew him when he was just starting his fly fishing career over 18 years ago. Some are grandchildren of his first customers. It was curiosity that got Julian into fly fishing, when two fishermen from Montana came to town with their fly rods looking for someone who knew the area. He took them to the flats, watched what they were doing, swapped a few stories, and a career was born. 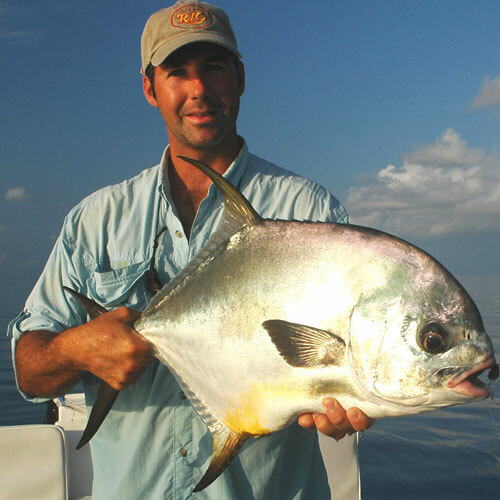 With his personable smile and salty language, Julian engages his customers and guests in lively conversation while stalking those elusive permit, tarpon and bones on the hunt for the Grand Slam. But, Julian is a purist, so don’t expect to have a quick fix with bait on your line. He still feels that with game fishing the thrill is in the stalking, the catch, maybe a quick photo,and the release. 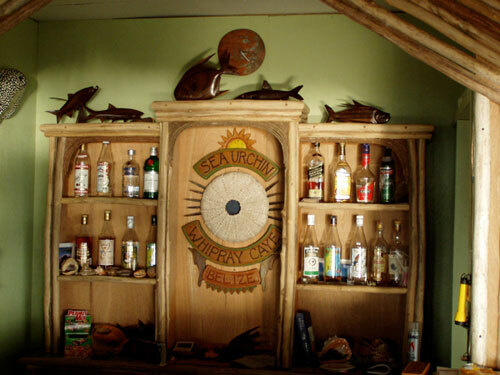 No one works harder than a good fly fishing guide, and Julian is no exception – thinking nothing of getting up to catch a 4AM tide, and stalking the flats until dusk, then having a lively discussion for the next few hours over a hearty Belizean meal and a nice cold Belikan in his restaurant (and he’s also a great cook). Julian ties his own flies and has created some that are reliable workhorses — but he uses whatever he feels will work that day to catch fish – the real reason he’s out there with his clients, anyway. What does Julian like about being a fishing guide? Fishing is his life, and as long as he’s fishing, he’s happy. Over the past 13 years it has been my pleasure to fish with Julian. During this time he has shown great patience and skill in instructing two of my sons (me too!) in the art of flyfishing. To complete the family cycle I have introduced my grandson and granddaughter to Belize, so I now have no shortage of fishing pals to share my annual 2 week visit. During these many years with Julian, he has demonstrated not only a knowledge of where the fish are, but how to catch them, in all types of conditions. Based on my own personal experience, it also important to note that Julian is not only hardworking and resourceful, but also a great cook and medic. 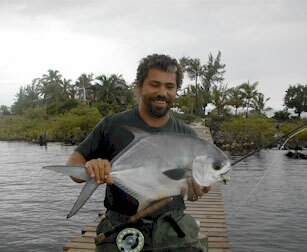 the “mentor” of the clan Cabrals of Placencia fly fishing guide fame. 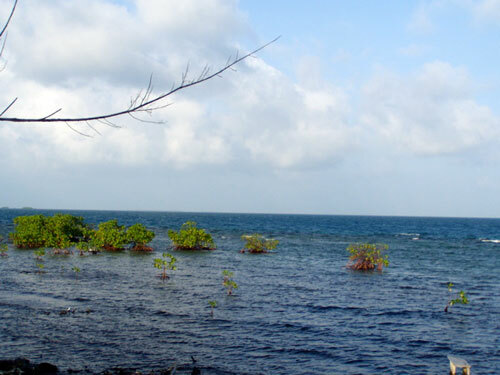 The infamous pirate Cabral that hid out in Placencia during the 1600s was probably responsible for the large clan of Cabrals who live in Placencia Village. At least 4 are fishing guides, and Julian is the mentor. Please use the lists below to find the package that suits your needs the most. Any package can be customized to fit your needs, need a 7 night package with three days of fishing – no problem we can do it! Just drop me an email and I will work out the price for you. 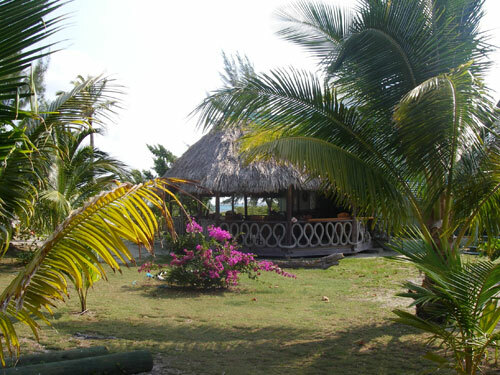 Prices Include: Includes all taxes, transport from Placencia Airstrip to dock pick-up point, transport to and from Whipray Caye and Placencia, 3 hearty family-style meals every day, cabana rooms with private bath and veranda, fishing (days normally start around 5am with a hearty breakfast, boat is equipped with lunch and water). Prices quoted are in US dollars. 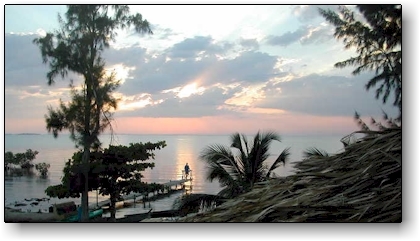 Use the drop down lists below to access some photos, and videos about Whipray Caye Lodge. 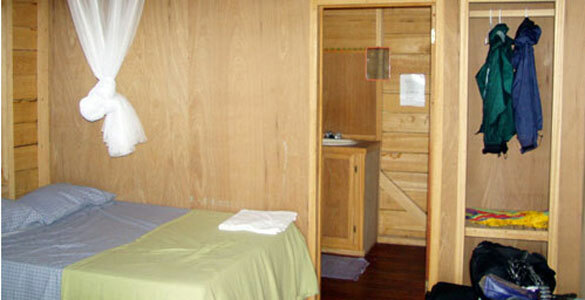 This can be a fun vacation for non fishers if you want a remote, private spot that is a bit on the rustic side for most. 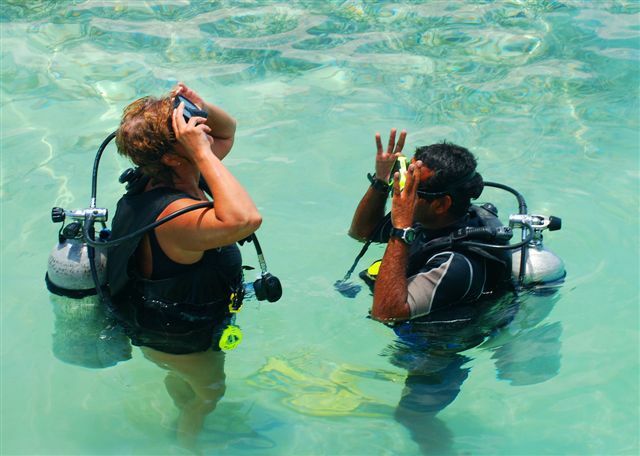 There is some great snorkeling, island hopping and nature viewing to be done, but you are far away from the mainland and tourist guides. This is not a destination for those who would like air conditioning, pools and amenities that are expected at a Caribbean resort. Your trip begins with a quick, scenic 30-minute flight to Placencia where the driver from Whipray will meet you for the short drive to the town dock. 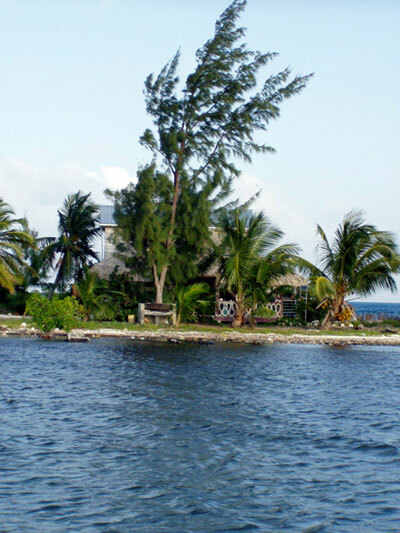 You will board the boat to the island and in about 30 minutes you are home at Whipray Caye.